Mixed omens on arriving in the land of the Olympian Gods. My bag was first off the carousel, but the moment I passed through the airport doors, I dropped my e-cigarette on the pavement and smashed it beyond repair. I took the airport metro for 10 Euros rather than a 38 Euro taxi. Getting off at Monastiraki, I exited the station and the Acropolis materialised illuminated above me. It reminded me of arriving in Berlin one winter night where my random exit brought me to the foot of the looming Brandenburg Gate redolent with grim history. But this time, the streets were swarming with revellers in the warmth of a pleasant spring evening. I found my hotel without problems thanks to some unusually successful interaction with a map. I thus looked very much like I was the new tourist in town and the streets I walked towards Omonia felt like they might be slightly dangerous – if this was a dangerous place. But it wasn’t. In ten days, nowhere suggested any sense of threat. Some streets looked very poor; the city threw up a light litter of homeless, but little sign of the desperate impoverishment I half-expected from their financial crash. Perhaps the warm spring night helped – even the one-legged man on my street corner seemed reasonably cheerful and secure soliciting coppers from his roadside post. The value of understanding the Greek alphabet occurred to me while looking at near indecipherable street signs. Also, how some maps give the streets completely different names. I had the first of my half-dozen gyros dinners. It became my default stomach-filler when nothing more creative sprung to mind. Afterwards I wandered up and down the old Agora – the ancient market place where Socrates once asked too many questions. Around the fringes of the nearby city squares hung small knots of young African men and the fug of marijuana. They appeared friendly, but set apart from mainstream Athenian life. I was pleasantly surprised not to be charged to visit the Acropolis. None of the usual hidden charges – the literature suggested I needed some form of ticket. Only two temples of note remain. 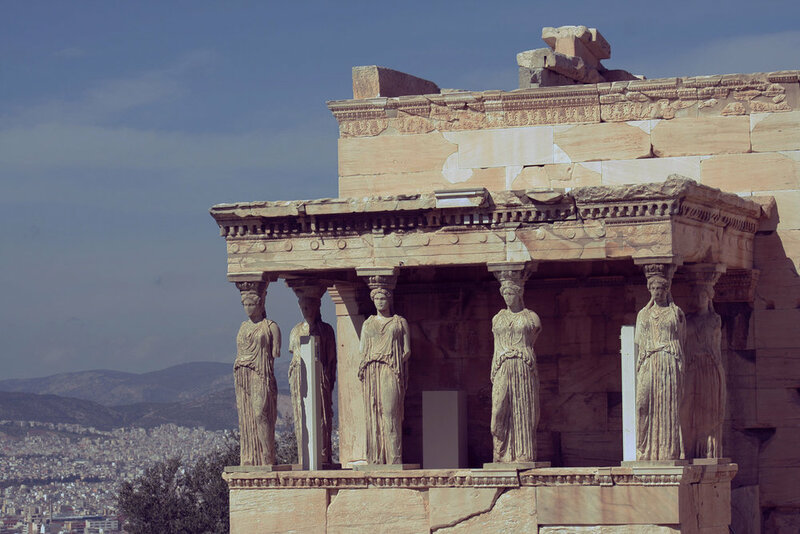 The Parthenon is in something like its fifth version. I was reminded how the Ottomans accidently blew one of them up four centuries ago as they thought it was a good place to store explosives. Bloody philistines. I chose to dine in Kolonaki. The small backstreets soon proved beyond the ken of Google Maps, my map, and me. I walked through a lively student area and eventually settled down outside a pleasant little restaurant in a cobbled street on a gentle hill. The waiter looked crestfallen when I turned down his huge platter of mezze with barely a glance, and plumped for a rather predictable Moussaka. Happily, it was magnificent and the Greek house wines were quite palatable. After a long search, I found out where I was on the map. I was in a place called Exarcheia. It was North-East of my hotel rather than the South-West I had planned. Ironically, it was nicer than Kolonaki despite what people say. Kolonaki, on my one brief visit, simply looked plush and full of luxury shops. In Kolonaki the following night, I chose the wrong restaurant by making the mistake – not for the first time – of confusing a welcoming smile from a waiter as a sign the restaurant was serving something I wanted to eat. I chose a souvlaki place having forgotten this largely involves more skewered meat. I ate vegetarian. Stupid on all fronts. The pretty receptionist was young enough to be a younger friend’s daughter, but her apparent enthusiasm for my cause still made me feel around 30. I commented on her brilliant English. In a Bristolian accent, she told me her father was English. Her colleague was equally helpful, which firmed up my false sense of youthfulness. I went for a walk in the national park where for reasons unknown I felt close to fainting. I drank lots of water and one of the popular slushy drinks that are no doubt required to deal with the full glare of an Athenian summer. I walked past orange trees and stumbled across a small pond containing several hundred turtles. 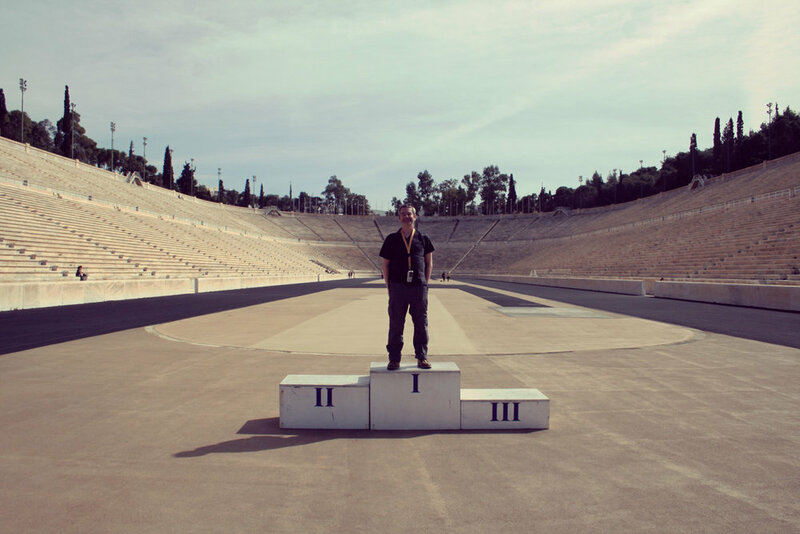 I visited the giant columns of the Temple of Zeus, Hadrian’s rather modest arch, and the impressive ancient Olympic stadium where the marathon of the first modern games ended. I later visited the Acropolis museum where there’s clearly plenty of room to slot in the Elgin marbles. My favourite exhibit was a Lego model of the site which combined past, present and imaginary in the characters swarming about it. They included Elgin pilfering the marbles, Elton John singing in one of the old theatres, and Gandalf arriving on a donkey. Beneath the southern shadow of the Acropolis, I discovered a maze of atmospheric narrow lanes mainly catering for tourists where the charm superseded the commercial. I remembered I was on holiday, and stopped for a beer. Lots of riot police on the streets as I walked home from dinner in Kolonaki but unclear what they were waiting for. The newspaper said bomb-making kit was found in an anarchist squat. I passed a small bookshop and was surprised to see about 100 faces – seemingly disembodied – staring out at me, or perhaps towards a charismatic author within. I booked a ferry to Mykonos on my smartphone – a rare foray into fully using the potential of technology. Nobody was going to do it for me. I was dissuaded from going to Santorini by a rather dismissive – and less alluring receptionist – as it was apparently too far, but didn’t like his suggestion that I should settle for one of the islands merely an hour or so away. Mykonos also has the added attraction of the mythical isle of Delos nearby.